Haki Forest pronounced "hay - kee" is a Fictional Race course set within the vast forests of japan and spans a total of 3.19 km. the track its self features 36 Garage spots, 11 corners and 1 layout. challenges include fast swooping corners, a bank curve and some cambered S's. The course layout itself is quite fast and easy to learn but with loads of time for the camber mastering risk taking wall shaving drivers. my current PB stands at 1:07.4 in a Mitsu Evo (around 460bhp). 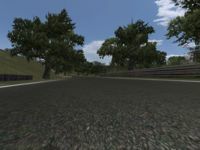 rfactor, dynamic shadows, no shadows option included. RELOADED FILEFRONT LINK FOR THOSE WITH MAS ERROR. SORRY!. There are currently no setups for Haki Forest. Add a Setup. Cool track man. A lot of fun lap after lap. Thanks for all your efforts. which mirror are people getting the mas error on? ill replace. sorry to those who are having issues. please try another mirror. "HakiForestMaps.mas file is corrupt" when extracting. Same problem.HakiForestMaps.mas has a file error.Can't race on this track. re-download.. this release was tested before public release. HackiForest.mas has a file error at unzapping. So the track doesn't work.